I had the privilege of interviewing Juan Pinera, a friend of the late Alfredo “Freddy” Tello, Jr., who was killed in 1997 by Samuel Sheinbein. Sheinbein was killed in an Israeli prison Feb. 23. This the first A-section story for The Washington Post I have worked on. It begins on A1, and my contributing tag is on A5. 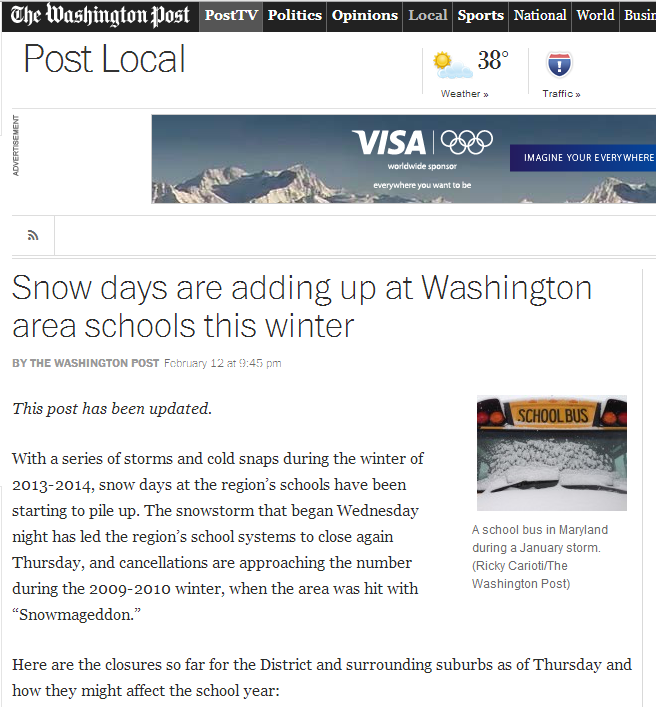 It also lived on the homepage of washingtonpost.com above the jump. It was a pleasure working with Dan Morse, Victoria St. Martin and Maria Glod on this story. Coordinated effort well done by all. Zach C. Cohen, Ruth Eglash, Victoria St. Martin and Jennifer Jenkins contributed to this report. UPDATE Feb. 25, 10:34 a.m.: This post was updated with info on the print story as well as mentions of members of the team I worked with. Another tragic story out of Seven Corners, Va. His wife got away safe, but Alvaro Zepeda will be missed by those who knew him. Thanks to my Spanish, I got to learn a little about Mr. Zepeda. Everybody I talked to described him as a friendly and helpful member of the community. My latest for The Washington Post. Special thanks to Dana Hedgpeth for doing the first write based on police reports and to Luz Lazo (an American University alumna!) for helping me with the more advanced Spanish. Read the story online at washingtonpost.com. This post has been updated with thanks to Dana and Luz. Each week on Latin Pulse, the able Megan Ekhaml hosts a roundup of that week’s news in Latin America. This week, I stepped in and earned the role of associate producer by guest hosting the newscast. This week, we focused on Venezuela, Colombia, Mexico and Uruguay. Thanks to executive producer Rick Rockwell for writing the script and editing the final package. If Lipnitskaia’s performance is inappropriate, then anything other than straightforward facts about the Holocaust, according to these commentators, should be forbidden. 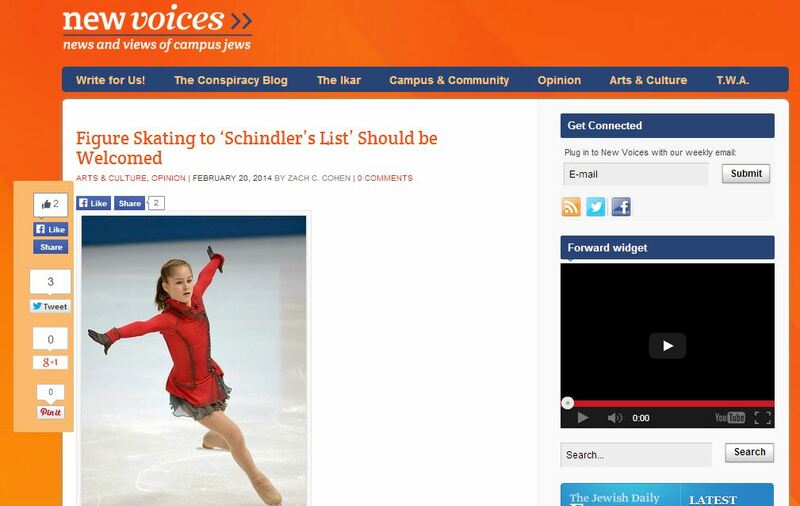 If art is meant to force its viewers to struggle with complex emotions, what is the difference between Spielberg’s use of Schindler’s List to make money and Lipnitskaia’s use of the movie’s theme to win points? Would these same commentators condemn Everything is Illuminated, a Holocaust movie that also contains some of the most brilliant comedy I’ve ever seen? Should libraries pull Phillip Roth’s Plot Against America off the shelves for altering the history of the Holocaust? Should Ballet Austin have shut down Light, a ballet that showcased the beauty of humanity and its suffering during the Holocaust? Should American University, my school, have shut down a children’s musical about the Holocaust (of which I was a cast member) because it originally had a song about cheese? When did political correctness force us to lose our humanity, our ability to recognize art for what it is: defiance of people like the Nazis who preferred a world of hatred and death? Read the rest of my take at New Voices. I returned to The Eagle newsroom for last week to for some marathon copy editing in the first print edition of the semester. Following some print delays, it was released today. You can also read the online at The Washington Post, my first clip for the education section. 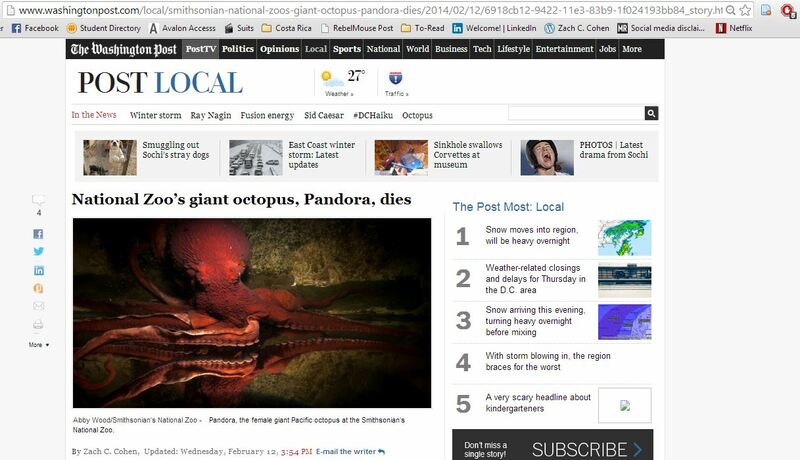 Washington’s favorite cephalopod, the National Zoo’s female giant octopus Pandora, has died, the zoo announced Wednesday. Pandora was 5 years old, the upper range of the median life span for her species, when she died Feb. 11. Read the rest of the story in The Washington Post. A tragic story out of Virginia Tech, with questions left unanswered. My latest for The Washington Post, on B2 with an A1 tease in today’s paper. My condolences to Sam’s friends and family. Everybody I spoke to said she was a sweet, caring, intelligent woman. Thanks to the legendary Martin Weil for helping me on my first Post crime story. Slain Tech student was from N.Va. 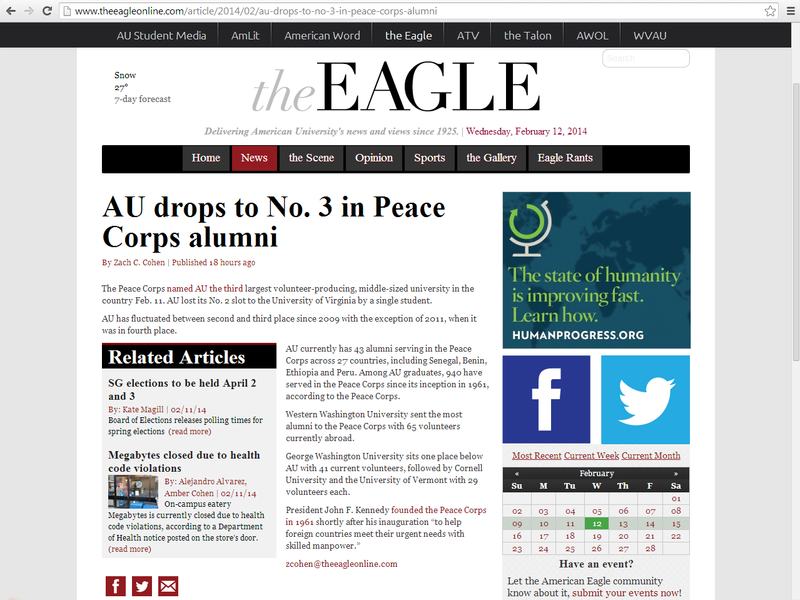 The Peace Corps named AU the third largest volunteer-producing, middle-sized university in the country Feb. 11. AU lost its No. 2 slot to the University of Virginia by a single student. AU has fluctuated between second and third place since 2009 with the exception of 2011, when it was in fourth place. Read the rest of the story at The Eagle.